Losing it all...is a new beginning. Amanda Legend grew up rich and privileged. Anything was hers for the asking, thanks to her superstar father. That is until Amanda's honesty about bad behavior from her soon-to-be-new stepmom, a former school chum, lands Amanda on the outs with her beloved father. No trust fund. No rarified world. Even if Amanda never wanted the LA lifestyle, she now must survive on her own. Ryan Sinclair was nearing the pinnacle of his movie career when he drove his Porsche off Malibu Canyon Road. Lucky to be alive, post rehab, he's ready to start the long climb back to the top. But to prove to Hollywood that he won't relapse, he's required to get a sober companion. After I read Hard Glamour, I just had to read this next book in this amazing series. I’m so glad I did because I thoroughly enjoyed Amanda and Ryan’s romance. I was not sure how the author was going to turn Ryan into a hero since he is not shown in a good light in the first book, but let me assure you, Ms. Marr does, and I was truly rooting for him to find the strength to overcome his addictions so he could have a happy ending with Amanda. They both richly deserved it! 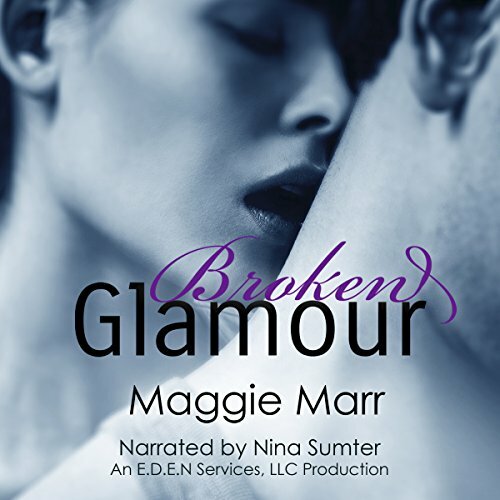 Broken Glamour is a well-written book, and the angst is handled fairly well without becoming too over the top. Both these characters definitely had issues from their past that explained their behavior. Now, I would have liked to have more of Ryan's backstory to fully explain why his character was so tormented. I’m not saying some is not there. I personally would have liked a bit more depth. Amanda’s character does give just the right amount of backstory, though. I listened to the audio by Nina Sumter. Her narrative had a bit of a sing-song tone to it which after a while became a bit annoying. There is also a male narrator, and he had the same tone quality. I did enjoy that the dialogue was read by the female and the male regardless of which POV the book was in. This is an emotionally-charged story that gave me a true picture that an individual’s struggle to accept that addiction does not just go away because the person is no longer using. It is a daily effort to keep away from the substance, and that a support group and getting a sponsor are the keys to recovery. Ms. Marr handles this in a spectacularly vivid way. I'm glad I read Broken Glamour, and I enjoy Ms. Marr's writing style a great deal. I highly recommend this book and the series. It's a story that will pull you in and keep you involved until the end. Happy reading! I liked this better than the first one, probably because I had already preferred Amanda to Laine as a character to begin with. Was happy with how the relationship played out and with how the 2 dealt with their relationship. Nina's performance was great, and I definitely think she brought out Amanda's character very well. I only write reviews if the story and reader are amazing or so bad I don't want anyone wasting their money/credits. This is a DON'T WASTE YOUR MONEY!!!! God the reader is awful, beyond awful. I am wondering if I can get my money back she is so bad. Does no one listen to these books, or test the reader? This reading person and service is beyond the worst and ruining the story. She is so flat, monotone and a bad reader/actor. I am really unhappy with this purchase. Maggie Marr, pick a better reading team.